I can not decide how to cut the front of my Croatian shirt. The pattern calls for a center front seam so the top placket can be folded from the fronts, rather than using a separate pieces of fabric for the placket. One one hand I really do not like the look of a center front seam, on the other, separate pieces add the bulk of seam allowances at the bottom of the placket area, which is covered by a shaped band. The extra bulk would show more as the garment gets washed and just like seams on jeans would show more wear on the seam edges under the shaped band. What to do? 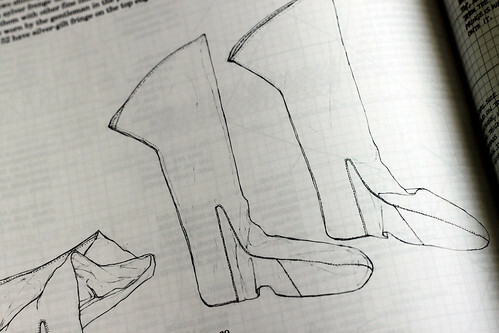 I thought I would look through “Patterns of Fashion 4” by Janet Arnold. The shirts in this book are of a much earlier period, so not much information on plackets. I had forgotten how absolutely fabulous this book is. It covers shirts, smocks, neckwear, headwear, and accessories from 1540 to 1660. 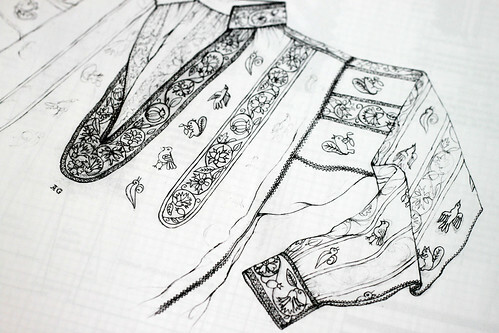 There are photographs, detailed drawings, and scaled patterns of actual garments. 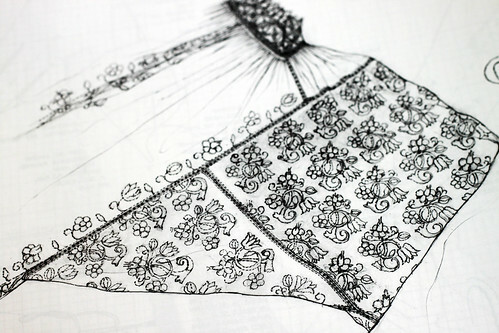 Since I am thinking of buying an embroidery machine soon, I saw lots of inspiration for embroidery placement. Below are a couple of nicely detailed drawings of shirt embroidery and the bottom photo is a drawing of the construction of woven socks. The time period is before the advent of knitting, but I can see where the shaping of the socks I knit now originated. This entry was posted on Saturday, October 10th, 2009 at 3:00 am and is filed under Book. Tagged: Book. You can feed this entry. You can leave a response, or trackback from your own site.